"Surviving Lehman Brothers," John Donohue, Managing Director & Head of Liquidity Management at RBC. Donohue leads the institutional distribution efforts to position RBC GAM as an industry leader in liquidity management. John has spent his entire career in short duration fixed income investment and held leadership roles within both portfolio management and distribution. 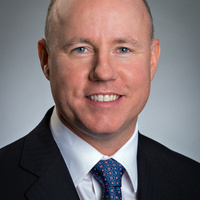 John joined RBC GAM-US in 2015 from Eaton Vance, where he was the director and head of institutional cash management services. Prior to this, he held senior level positions at Dwight Asset Management, where he was executive vice president, head of liquidity management and Neuberger Berman (formerly Lehman Brothers Asset Management), where he was chief investment officer, head of global cash strategies. John is a member of the iMoneyNet Money Market Advisory Board and Conference Faculty. He is also a frequent presenter at industry conferences such as Association of Financial Professionals events, and global forums including the American Chamber of Commerce in Singapore. He has worked in the financial services industry since 1992. John earned a BA from Saint Anselm College, an MBA from Assumption College and holds FINRA Series 7 and 63 licenses.